The PDR 1878 Cubano Especial Capa Natural cigars are beautifully handcrafted in PDR's boutique factory in the Dominican Republic using the complex "entubado" rolling technique. The mild to medium-bodied Capa Natural is wrapped in a silky Ecuadorian Connecticut Shade leaf known for its mild flavor and slightly sweet character. The savory blend of Dominican and Nicaraguan long fillers are further enhanced by a Dominican Criollo 98 binder leaf that brings some spice but doesn't overpower. 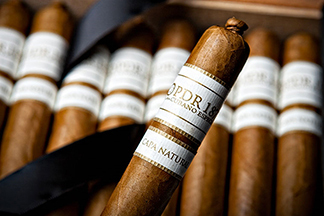 PDR's Capa Natural is a creamy, smooth and well-balanced smoke with a woody, herbal character and a suggestion of sweetness on the finish. It's a premium cigar you can enjoy any time of the day.